Dynamic aspects of colloidal dispersion form a critical basis of the engineering science of soil and water quality when the relation between microscopic physicochemical and hydrodynamic conditions and macroscopic hydrological transport phenomena is considered. 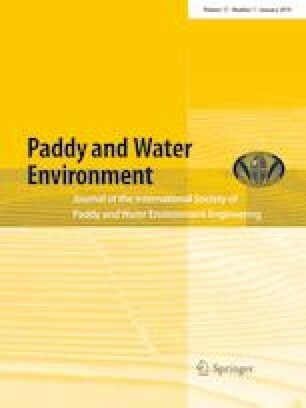 Examples in the paddy and environment can be found in the transportation and diffusion of pollution in the discharge of irrigation water. In this review, I focus on this validity with emphasis on the fact that the majority of colloidal materials in the soil and water environment are apt to flocculate. That is, the mechanical unit of transportation is a floc rather than individual fine matter: fragments of clay particles, insoluble metal oxides and any other natural organic matter, such as protein, polysaccharide and humic substances. On the surface of colloidal materials present in soil and aquatic environments, it is known that many chemical substances, nutrients, agrochemicals and pollutants are concentrated by adsorption or sorption. In addition, such adsorption and sorption behavior will alter the nature of the colloidal surface to induce different types of colloidal flocculation and complexation, which will result in differences in the transport phenomena in the aquatic and soil environments. Therefore, the analysis of flocculation dynamics in relation to adsorption of chemical substances onto colloidal particles is a key factor in comprehensive management of soil and water environments. For this purpose, we have carried out a study of flocculation by choosing four clay minerals: allophane, imogolite, montmorillonite and kaolinite. The choice was rather arbitrary but has been established to cover mostly different shapes and surface properties. Comparison with results obtained for a colloidal system composed of monodispersed spheres and polymeric flocculants is found to clarify the validity of the framework of analysis. The strategy is very useful to accumulate characteristic data and has opened the way to further analysis of the complex system of soil and aquatic environments. This work is funded by Grant-in-Aid for Scientific Research (16H06382) from the Japanese Society of Promotion of Science.